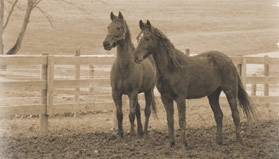 Horses Forever believes that every horse deserves to live with dignity. Every horse deserves proper nutrition, adequate shelter, attention and love. Every horse deserves to be cared for and appreciated when their working day is done. Every horse. Just up the road from my home is a field, with two horses in it. From a distance, each looks like every other horse. But if you stop your car, or are walking by, you will notice something quite amazing. His owner has chosen not to have him put down, but has made a good home for him. If nearby and listening, you will hear the sound of a bell. Looking around for the source of the sound, you will see that it comes from the smaller horse in the field. Attached to her halter is a small bell. so he can follow her. friend isn't too far behind to hear the bell. others into our lives to help us when we are in need. the little ringing bell of those who God places in our lives. Other times we are the guide horse, helping others see. Please listen for my bell and I'll listen for yours.